Come see us next Saturday September 17 at The Makers Festival lin Manahawkin, NJ! Where do the sachets fit in? Before there was an official Forage Workshop, I dabbled in lots of different mediums in art and in crafts. I started making sachets filled with balsam mainly for myself, I LOVE the smell of balsam, and to give as holiday gifts. The eye pillows were a soon second for exactly the same reason. I soon found that I had more than I needed, but I wanted to make even more, it was such a satisfying process! So I went downtown and talked to a local shop owner who suggested I put them in the towns seasonal holiday boutique. I put in a bunch of balsam sachets and some catnip toys as well. (another creation I had started making mostly for my own cat, Moose) Both items sold very well! I even had my balsam sachets featured in a blog! It was such a gratifying experience! I was hooked. I kept at it, returning the following holiday season to sell in a local shop and to be a “featured maker”. The following year I was laid off from the full time job I had held for 12 years. I felt free to try out all of the things I had always wanted to do, including making things to sell at local craft shows and markets. Forage was officially born! My focus of course was, and still is, wood burning, but I have never left behind the spark that started it all, my sweet smelling sachets. I am the type of person who likes to use what she has. It might be a harder road, but I enjoy transforming something into what I need it to be. Also, it makes a heck of a lot of sense from an environmental standpoint. I mean geeze, these logs are just rotting away, why not make something awesome out of them! Such a better way to go than killing or damaging a beautiful living tree, or going to a craft store to buy wood where they process and mass murder trees to get their boring, perfect product. Foraged wood isn’t perfect. It isn’t pristine, white wood ready for me to make my mark on it, but that’s why I love it. It’s MORE than perfect, it’s a beautiful mess. Just a few days ago I had a new request for a change in scene. A grandparent wrote to me asking me to change the moon from a crescent to a full. 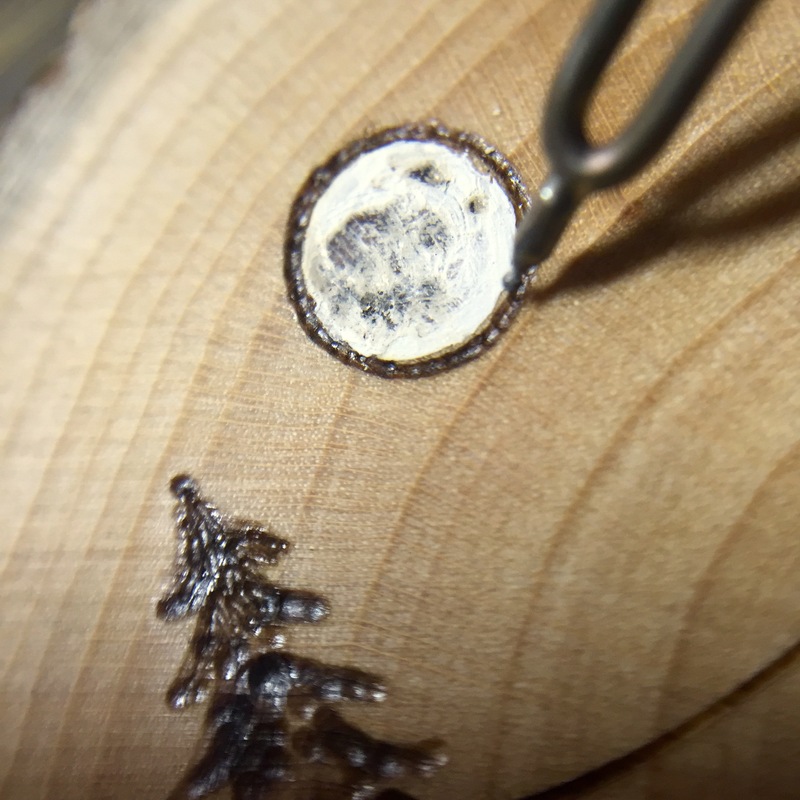 She had taken her grandson on his first camping trip to Big Sur along the California coast and the moon was so full, so big that it really made an impression on them both. I imagined the sea air combined with the smells of the forest, the 2 of them sitting outside their orange tent marveling at the beautiful, humongous moon and I smiled. I’m smiling now picturing that sweet moment. 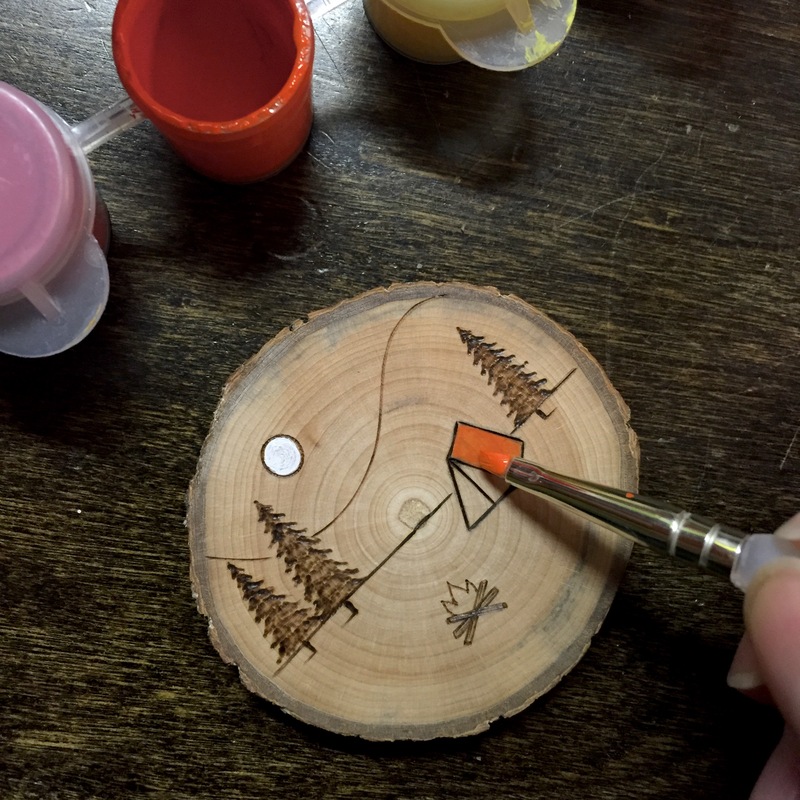 I’m trying my best to capture that feeling on this wood slice ornament for them, so they can look at it every Christmas, and remember that trip and smile. I have been a wood lover for far longer than I have been a woodworker. I often admired (still do) the beautiful patterns in the wood, the colors , the rings, the stories. But when I first started making my items I was always looking for “clean” wood. 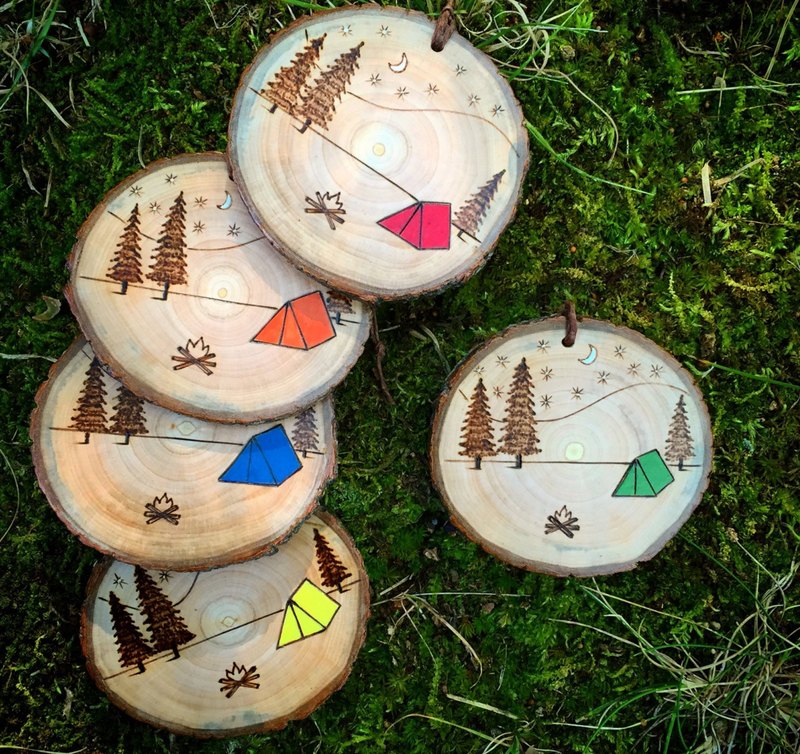 I thought my wood burning designs had to stand out against a stark white maple background, but, being a forager, this was not often what I was given. Gathering fallen wood from my property or my friends wood piles or the side of the road, often I get soggy wood that needs to be dried out a bit before I can work with it. This wetness seeps into the wood often creating irregularities and patterns. My frustration has evolved into fascination with these “damaged” pieces of wood that I work with. “Mother Nature’s watercolors” is how I have come to think of it. It turns out that not surprisingly, I am not the only one who has found beauty in the damage. The term for it is spalted, and many a woodworker has come to value these pieces highly. Perfection is boring, give me your discards any day.